From Flashcards to word association and matching pair games there's something here to teach, delight and entertain pre-schoolers of all ages. 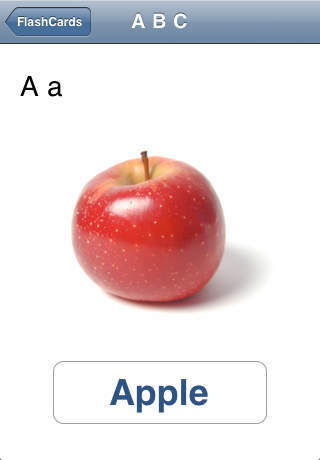 Version 1.0 contains images for more than 100 objects, shapes, colours, animals and more with word spellings and voice recordings in British English for each. Choose from a male or female voice. Our 'Can you find' game encourages your little one to find things they recognise. This promotes word and picture recognition based on the things they have learned in the ABC section of this app. They are rewarded with praise for a correct 'find' and encouraged to try again if they get it wrong. In the 'What's this?' game, your child is shown a photo of something from the ABC section, and asked to identify it by it's word name. They are given 4 choices and get feedback for a correct or incorrect answer, helping them to learn to recognise words like lion, star, spoon, black, ice cream and 100's more! The final game is 'Matching pairs' What toddler doesn't love playing this game! They are presented with 12 boxes to press, revealing two at a time to match - hours of fun while improving their memory skills. As parents ourselves, the staff at Flame Red realised there was a need for engaging content, which was simple to operate for children from 12 months onwards, and was presented with 100% British English pronunciations. 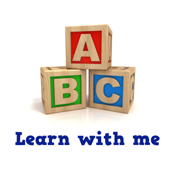 So we put our heads together and came up with A-B-C Learn With Me, trying it out on the best software testers we know - our own twin toddlers! We think we've produced a great product which will inform, enthral and entertain for quite some time, so why not take us as our word and try it out?